Motor sport is one of the few sporting activities in which men and womencompete alongside each other on an equal footing, yet as they make uponly 8% of registered licence holders, women are hugelyunder-represented among motor sport drivers. There are, nonetheless, an estimated 50,000 women actively involved inBritish motor sport, organising events, running clubs and associations, timekeeping, marshalling and fulfilling a host of other support roleswithout which the sport itself could not continue. "There's no doubt people presume it is a sport for men," says NickiFawdington, the Chief Marshal of the Castle Combe Racing Club. "But thetruth is both among competitors and organisers there is far more femalerepresentation than you would imagine. We have 56 female members, whichis above the national average at around 13% of the total and they play avital role in the club. But it would be nice to improve therepresentation." The circuit has a disproportionately significant female presence ontrack, with Hove's Ilsa Cox probably the best known after winning thecircuit's Saloon Car championship outright in 1997. 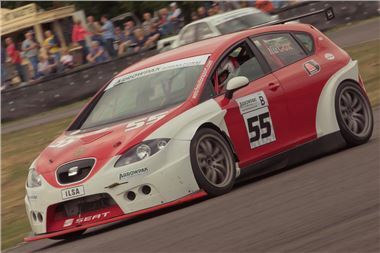 She still competes at selected events at the circuit in her powerful SEAT Cupra. Regularlycompeting in the Saloon Car championship are Chippenham's Geraldine Duffin her Rover 25 and Anne King from Manningford Bruce near Pewsey in herMG ZR. Brinkworth's Kelly Williams competes in the 3 litre class in herFiesta ST.
A rare female participant in the circuit's Formula Ford 1600championship will be Dr Denise White from Chepstow. She will debut a VanDiemen in the Pre 1990 section this season. Driving a car in the circuit's Sports and GT championship which many menwould be incapable of handling is Bath's Nadine Geary in her mighty 8.3litre Dodge Viper GTS-R. She has also embarked on an ambitious projectto race the Honda Earth Dream Formula 1 car formerly driven by Rubens Barichello in the circuit's new MonoLibre series for 'anything goes'single seaters. The car is being fitted with a similar Dodge Viper engine to that in her regular racer and is more likely to be ready forthe 2012 season. "I think International Women's Day is a great initiative," says Nadine. "We need to show everyone this is a sport for girls as much as for boys.The more people see girls racing and getting involved in motor sport,the more will be attracted to it." International Women's Day aims to draw attention to the exploits ofwomen around the world. The Motor Sports Association's Women inMotorsport group aims to capitalise on this initiative and demonstratethe world of motor sport is a welcoming place for women. For more information about getting involved with the Castle Combe RacingClub, contact Nicki Fawdington by email at afawdington@hotmail.com.